Today the Holy Spirit, through the mercy and grace of Christ, has brought us together to pray, “Abba”, to our Heavenly Father. We gather to celebrate and wonder at the infinite mystery of the Most Holy Trinity, One God in Three Persons. Christians for generations, scholars and contemplatives, gifted and humble have all sought to understand and explain the unexplainable. Through the ages diverse teachings have argued and sought to take this real mystery of faith and congeal into a concept of understanding comfortable to the minds of a particular group. Whether it be the early Gnostics, Arianists, latter day cults or even contemporary groups who would deny the concept of God the Father we see a recurring efforts to try to squeeze the infinite God into our very finite box of a limited human intellect. The effort to understand..to relate to this infinite, eternal mystery is noble and good. But we would do well to allow our understanding to develop, our knowledge to increase through the grace of God that would enlighten our minds as we seek God in faith and love. The living Word of of the Holy Trinity, the Scriptures we shared this day, all share a common, simple, yet infinitely enlightening invitation. We are called to grow in an ongoing relationship with God, Father, Son, and Holy Spirit, through which our spirit, minds (souls) and bodies would grow in the eternal truth that is God. Yet even this invitation is a challenge to our limitations. But God’s mercy is so great that He gives us simple, albeit limited, illustrations to help us in our quest. As Christians we are baptized in the Name of the Father, the Son and the Holy Spirit. Sacramentally, and literally translated we are IMMERSED into the Father, Son and Holy Spirit. As a part of that holy act we, the baptize , are often given a given a candle from which the fire from the Paschal Candle is lit. This is said to symbolize our carrying forth the Light of God in our Hearts. So it does. 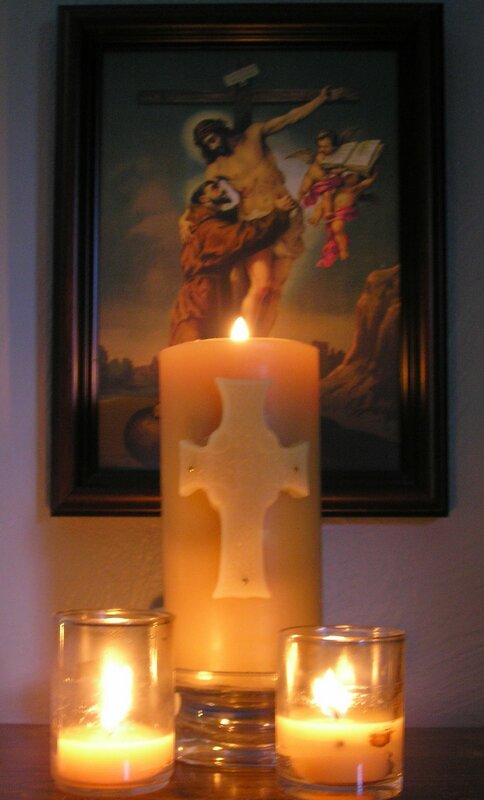 Yet that simple lighted candle also symbolizes this Holy Trinity into which we are immersed. God the Father ~ The Wax: The heart, the source of infinite mercy and love from which the wick draws His passion to be ignited through the power of the Holy Spirit. The wax, mysterious yet containing the very essence of life and creation. This congealed beauty of sunlight and flowers carried by winged servants the sweetness of honey and life in the hive. Yet stung by the wounds of life, or blinded by artificial substitutes humanity often is blinded to the the very love of the Father, the Love that is God to which we are created to call, our Abba, our Father. God the Son ~ The Wick: The beauty and warmth, the hidden grace of life can only be realized through the wick that carries that truth to our souls. Drawing from the infinite depths of mercy and hope the love of the Father was sent to burn eternally through His Son, Christ Jesus. Revealing the Father’s mercy in the darkness of the Cross Jesus has shown the Light of Life with the dawning of the Resurrection. The indescribable beauty of the holiness of Heaven is revealed through woven fibre wick of the life of Christ, God’s Son incarnate. God the Holy Spirit ~ The Flame: But this beauty of holiness, infinite light of love would not be seen without the flame, the passion of the Holy Spirit. Last Sunday at Pentecost we recalled how that initial immersion of the early believers was seen through flames descending upon the faithful. And through the ages this same light of the Father carried by the Son, lit in the fire of the Spirit would shine. God seeks to bring light to those in darkness, hope to those in despair healing warmth to those whose love has grown cold. Today, this Feast of the Most Holy Trinity, may we allow our baptism to be bring alive the candle of God’s Presence anew in our body, mind and spirit. May the Flame of the Holy Spirit burn within each of us the Passion of Christ drawing upon the infinite holy Love of the Father. Accepting the peace of this mystery let us share this light in our relationships with God, and each other that, together, we may grow in the fullness of God.